My creativity has been all but forgotten lately as we go about the bittersweet task of cleaning out my parents' apartment. 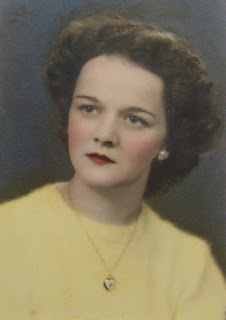 My mother died four weeks ago today, just about four weeks after my dad's death. Such a shock. My sister, brother and I have had our share of weeping, reminiscing and laughing as we find forgotten photos and memorabilia from the past. Apart from the furniture, knick-knacks and personal possessions, the greatest treasures are our own personal memories which we carry in our hearts. I'm finding myself seeking some time for reflection, solace in time spent laughing with friends, and especially the comfort of time spent with my own family. 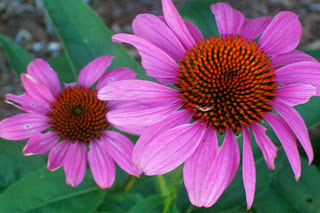 My good friend Debbie brought me two coneflower plants, one for each of my parents. I'm not much of a gardener, but the act of planting them with my husband became a kind of ceremony in a way. 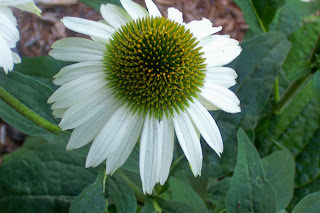 And seeing the lovely flowers each day gives me a sense of peace and appreciation for the kindness of a friend. We had beautiful, sunny weather in New England today. 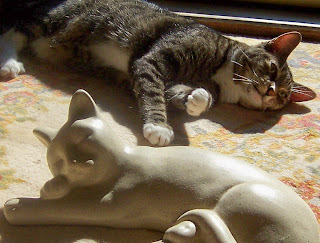 Early this morning I caught our cat Kristy stretching in the sun with a stone cat I use as a door stop. They are about the same size and look like pals on the carpet by the front door. Like most cats, Kristy has her own special "hangouts" around the house, her favorite being our little screened-in porch. Sun, birds to spy on, insects to chase - did I mention sun? Cat heaven!! 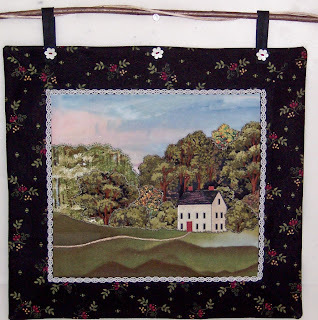 I made this wall hanging last year and sold it at our fall sale at Lexington Arts & Crafts Association. It's entirely made from pieces of commercial fabric pieced together with machine satin stitch. The little lace inner border and flower buttons added, I thought, a whimsical touch. Making little pictorial wall hangings is something I've enjoyed for many years. I have a big box of fabric scraps backed with fusible web, and, when the mood strikes, it's fun to snip away shapes, iron them down, and stitch up a picture! My dear mom passed away on June 28. Although she had been ill, her death came much sooner than expected. She was a kind, interesting, and funny woman who loved her family, all kinds of handwork, volunteering and doing crossword puzzles. She was a lady in every sense of the word. If you have read my previous posts, you know that my dad passed away at the end of May. I can't help but think that she wanted to be with him. They were married for 64 years and knew each other since they were children. She recently told my aunt that she was "crazy about the guy". After she died, there was a heavy thunderstorm. When that had ended, my niece Amy stood up and said excitedly, "Look out the window!" We raised the blinds at her hospital window and saw a huge rainbow stretched across the sky. Thanks for the sign, Mom.